Directory of 21 Moose lodges, guides and outfitters in . We do our moose hunts in the boreal forests. Hunts are done in September and October, when lovesick bulls come to the call. This hunt is very exciting and challenging. We hunt from wall tent camps, as well as cabin accommodations. Hunts are remote, fly in or take ATV’s in to the back country. We also have jet boats and an airboat to offer some different hunts. Our Moose hunts have a very high success rate. The quality and size is excellent for Canada Moose. View Trophy Moose. Space is limited, so book early to get the best spots. Alberta Bush Adventures has a limited number of moose hunts available each year. The terrain in this part of Alberta is mostly flat, heavily wooded with aspen, spruce, birch and willow forests. Muskegs, creeks and small lakes are prevalent. Moose hunting in Alberta is a very exciting experience. Hunts will be taking place on foot, with atvs, boats, and pickup trucks, driving logging and oilfield roads. The weather will be between 30F and 80F. Moose that are rutting will move during all hours of the day. Once a moose is spotted your guide will establish size and quality of the moose. You should be seeing moose between 30” to 50”. If the moose is a “Shooter” you will pursue all possible shot opportunities. After you have harvested a moose we will take some great pictures, and skin and prep the animal for the taxidermist of your choice. There may be opportunities to harvest a wolf and or coyote as well. Thank you for taking the interest in hunting Alberta. We have one of the best moose hunting areas in Alberta. We have exclusive access to over 70 quarter sections of (deeded) private property.Our hunting area is near the town of Wainwright, Alberta, approximately three hours southeast of Edmonton, Alberta. Surrounded by farmland, rolling hills and the famous Battle River, this area possesses all the natural habitat required to produce quality trophy moose. Limited hunting pressure, a good food source, plenty of cover and exclusive access are all keys to a quality moose hunt! AWGS now offers 2 areas & timeframes for you to choose to hunt Canada Moose with a bow. Our 1st Rut hunt takes place in the middle to late part of September as the cows are just starting to come into heat. The area for this first hunt is quite remote, and you'll hunt out of our comfortable tent camp, while we do calling set-ups to get in on the action at the onset of the 'Rut'. We have a very limited number of Shiras moose hunting tags available. Shiras moose hunting trips are in the prime rut, about the first week of October. We call the bulls as well as spot and stalk hunt. You will be based out of a tent camp deep in the Canadian Rockies you will explore prime Shiras moose habitat as only possible by horseback hunting. 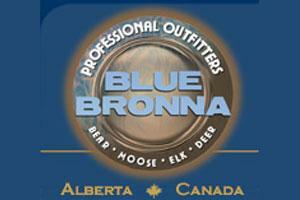 Blue Bronna offers Western Canadian Moose hunts in different areas. For those of you looking for a more comfortable moose hunt we have 4 hunts available annually from our home in the south central farm area of Central Alberta. Those wanting a more traditional hunt may favour the calling season Boreal Forest hunt of north Central Alberta. Freeman River Adventures offers guided rifle moose hunts and archery moose hunts in the Central Region of Alberta, Canada. We offer archery only hunts plus rifle and/or archery hunts. Hunters can combine our moose hunts with other big game hunts. No matter which moose hunt you choose, we are sure you will have an unforgettable experience. Trophy moose bowhunts & rifle moose hunts in Alberta, Canada. Moose hunting take place in the world famous Peace River Country. It is known for having one of the highest Moose densities in North America. Our moose hunts have been very popular. Due to the Alberta's management of moose, we have been taking high quality animals each year. Every year we are taking moose in the 50" + range with our largest being 63". We have three different moose hunts to choose from as well as combination hunts for moose with Black Bear, Whitetail, Mule Deer, Waterfowl, and Elk. If you are looking for the opportunity to hunt the Canadian Rockies in search of the illusive Canadian Moose we have a treat for you. Alberta is home to the Canadian Moose. These animals are big strong and fun to hunt. Our bulls average between 40- and 55 inches. We have seen larger and had opportunities to harvest 60+ inches. The Alberta government has implemented a good moose management system and almost the entire province is now on a limited entry draw for residents. Our tags however are guaranteed. However we have a limited number and they fill up quickly. So don’t delay in calling us and booking your Canadian Moose adventure. Looking for big Canadian bull moose, check us out. We have trophy moose 40”-55” and have seen larger. This is due to Alberta’s new moose management program and it’s making moose hunting magic. All moose tags are now on draw for residents and has very limited guaranteed tags for non-residents. We typically hunt the forest and bogs for these majestic swamp monsters. Most moose hunts are conducted from stands, stalking, and calling during rut. Smoky River Outfitting offers Canada trophy moose hunts in the foothills of Alberta Canada. On this hunt hunters will be expected to pass on bull moose under 50 inches. This area produces many B & C bull moose from 50 to 60 inches. We offer these trophy moose hunts during archery moose season, Rut moose season and in November (Post Rut) when bulls are in bachelor groups feeding in valleys. These hunts take place in the absolute premium units in the province of Alberta. This hunt takes place in the foothills on the edge of the mountains and many provincial parks. A very limited number of tags are issued in these areas the few we have are guaranteed licenses. This is a ridgeious mountain hunt, it is not for everyone!!! Trophy Hunters Alberta is Alberta's premiere Moose outfitter, owning some of Alberta's best allocations for the species throughout the forested area leading into the slopes of the Canadian Rocky Mountains. THA has 66 moose allocations offering both archery and rifle hunting experiences. Prices for moose hunts in Alberta are typically about half of the price charged for a moose hunt in Alaska, the Yukon or in British Columbia. Trophy Hunters Alberta is renowned for its moose hunting successes in Alberta. We specialize in guided moose bowhunting in the remote wilderness of Alberta Canada.